Configuration P Beverage-Air Market Max MMRF72-1-WW-LED White 3 Section Glass Door Dual Temperature Merchandiser - 72 Cu. Ft. I live in California. Can I still purchase this product? Because this product does not meet the California Cooling Act standards, it is not available to establishments located in the state of California. Double your merchandising possibilities with this Beverage-Air MMRF72-1-WW-LED white 3 section glass door dual temperature merchandiser! With 72 cubic feet of storage, a lighted sign panel, and digital temperature monitoring, this merchandiser allows you to easily monitor quality and increase impulse sales of all your chilled and frozen goods! Adding graphics to this unit may increase the shipping time. For more information on specific shipping times, contact Customer Service. 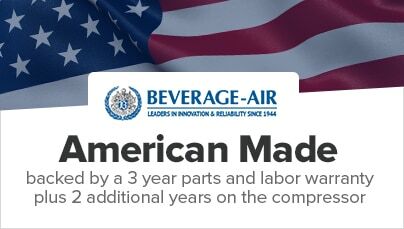 Note: Beverage Air equipment purchased in 2013 or later will have a 3 year parts and labor warranty. Equipment purchased prior to 2013 will have a 1 year parts and labor warranty. RESIDENTIAL USERS: The right is reserved to deny shipment for residential usage; if this occurs, you will be notified as soon as possible. Beverage-Air Market Max MMRF49-1-BW-LED Black 2 Section Glass Door Dual Temperature Merchandiser - 49 Cu. Ft.
Beverage-Air Market Max MMRF72-1-BW-LED Black 3 Section Glass Door Dual Temperature Merchandiser - 72 Cu. 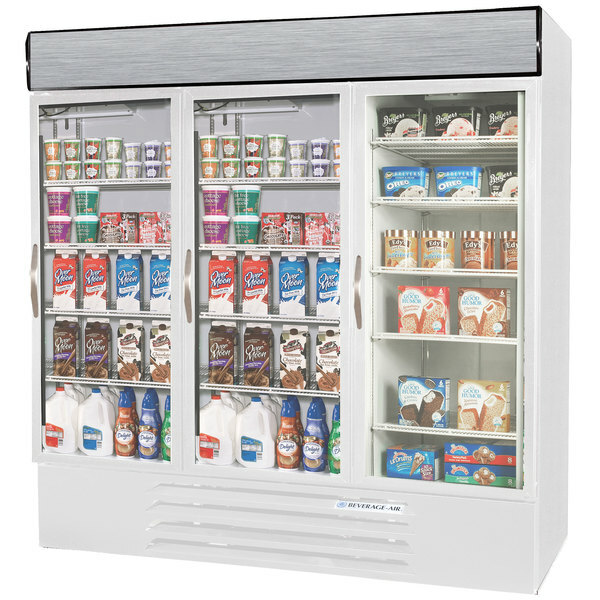 Ft.
Beverage-Air Market Max MMRF49-1-WW-LED White 2 Section Glass Door Dual Temperature Merchandiser - 49 Cu. Ft.
Beverage-Air Market Max MMRF49-1-SW-LED Stainless Steel Two Section Glass Door Dual Temperature Merchandiser - 49 Cu. Ft.
Beverage-Air Market Max MMRF72-1-WW-LED White 3 Section Glass Door Dual Temperature Merchandiser - 72 Cu. Ft.
Beverage-Air MMRF72-1-SW-LED Market Max Stainless Steel Three Section Glass Door Dual Temperature Merchandiser - 72 Cu. Ft.